GRAMMY® Award winner Norman Brown is on close intimate terms with his audience. 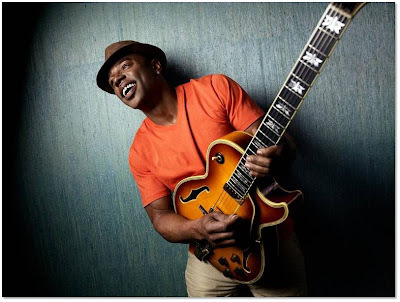 For almost two decades, it has been an engaging, mutually rewarding relationship, with the multitalented guitarist, composer and singer offering tasty sonic tidbits of classic R&B and contemporary jazz and his fans melting into satisfied aural bliss with every succulent, jazz inflected note. It‟s a veritable “love fest” – and Brown keeps the good vibes going on his long- awaited new release, Sending My Love, arriving this June on Peak Records. “I‟m a loving guy -- I hear that a lot. I started reading my emails and the fans were sending me so much love that I wanted to send them love back,” explains the artist, who wrote nine of the ten tunes on this offering. “The CD is about pure love, love in all its many aspects: a personal relationship and a general love for the planet and for people. We should be kind to each other,” he adds. Born in Shreveport, Louisiana, and raised in Kansas City, Kansas, Brown first picked up a guitar at the age of 8. Inspired by Jimi Hendrix‟s mind-bending rock sounds, Brown soon discovered his father's favorite artist, Wes Montgomery, and found his stylistic holy grail. After high school, Brown moved to Los Angeles to pursue his musical career, attending the Musicians Institute where he also taught for a time. While playing with his own group in local clubs, and drawing comparisons to George Benson, Brown was discovered and signed to the MoJazz label, a division of Motown. He delivered his 1992 debut, Just Between Us, and followed with the gold- certified After The Storm and 1996's Better Days Ahead. With critical acclaim and sales behind him, the talented musician made the leap to Warner Bros. and released Celebration, which first teamed him with producer Paul Brown. The 2003 follow-up, Just Chillin', earned Brown much-deserved recognition with a GRAMMY® Award in the best pop instrumental category. That project was followed by his 2005 release West Coast Coolin', where Brown tested out his skills as a vocalist, a move that was welcomed by the urban AC radio market. In addition, his 2005 compilation The Very Best Of Norman Brown was one of the best- selling smooth jazz albums of that year. Brown made the leap to the Peak Records label in 2007 for his smash CD Stay With Me, which yielded the R&B vocal hit “Stay With Me” and the smooth instrumental favorites “Let‟s Take A Ride” and “Pop‟s Cool Groove.” With the brand new Sending My Love, Brown is building on the musical foundation he laid with Stay With Me, which landed at Number One on the Billboard Contemporary Jazz Albums chart. In addition to success as a musician and producer, Brown has launched a successful career as a broadcaster. In January of 2007, he brought his engaging personality to Broadcast Architecture‟s Smooth Jazz Network as an on-air personality, hosting this own weekend radio show. But performing is his first love. For yet another year, Brown will share his onstage fire with the launch of the 2010 version of the annual Norman Brown's Summer Storm tour. With a string of dates stretching from May to September, Brown will share the magic of Sending My Love as well as his many beloved hits.